This weekend, The m9 is in Vancouver, BC for the annual Ederlezi Brass Festival. 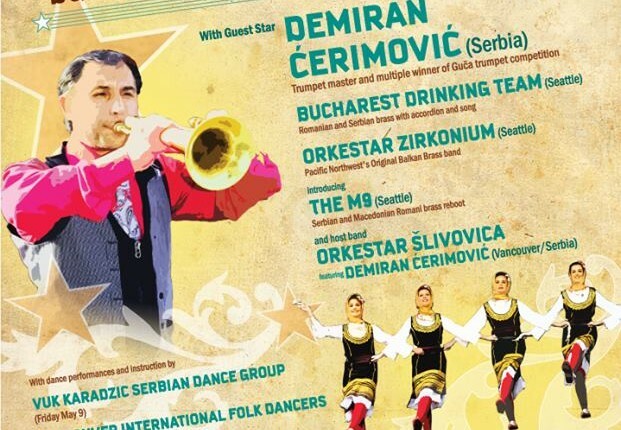 The festival features three-time Guca winner, and master trumpeter Demiran Cerimovic as well as Balkan bands from around the northwest. Featured this year will be Orkestar Zirkonium and the Bucharest Drinking Team, each of Seattle, Washington and each sharing members with The m9. The festival host band is the venerable Orkestar Slivovica. If you have the chance, check us out Friday night at 9 or Saturday night at 8. The doors open at 7 each night, and links to tickets can be found on our events page. We’re ready to rock Vancouver with our own take on the Balkan brass sound. Ziveli!